You may like to combine your visit to Gembrook Market with a visit to a children's playground / skate park. Alternatively, a short walk or drive will take you to: Gembrook Park, Kurth Kiln Park or Bunyip State park. There are walking tracks at each of these locations. Gembrook Park (28 hectares - see picture on right): From the Market, just a 5 minute walk down Gembrook Road to Redwood Road (Memorial Avenue) will find you in Gembrook Park. A stroll along the Nature Trail will dwarf you among the giant mountain ash trees. 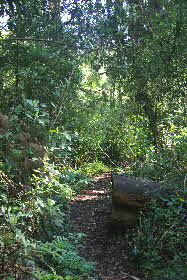 Within the fern gully you will experience the quietness of the bush. (Please note: walking tracks may be muddy in wet weather). Collect your 'nature trail notes' from Puffing Billy Station or from the information shelter at the park itself. Kurth Kiln Park: Kurth Kiln, with its natural picnic ground and the many walking tracks along Tomahawk Creek is a memorable experience in local history. On Beenak Rd, 7km north of Gembrook, it is suitable for a bush picnic or weekend camping. Bunyip State Park: The park is situated 65 km east of Melbourne. You can get there via Gembrook, from the Princes Freeway, or from Woori Yallock (Melway Ref 612 K5). The park covers 16.600 hectares with 300 km of roads and tracks, so there is plenty of room to venture out and explore the bush.